I LOVE to drink delicious coffee. Drinking 16oz of coffee each morning is one of my daily rituals. 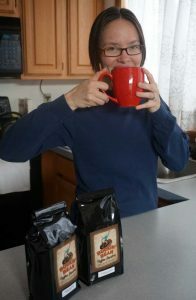 Christy drinking strong Ethiopian coffee! Technically coffee is derived from a bean and beans are known to be high in nickel. The original green coffee beans are roasted, where they actually turn brown, anywhere between 200 °C / 392 °F for a light roast to 245 °C / 473 °F for a dark roast. 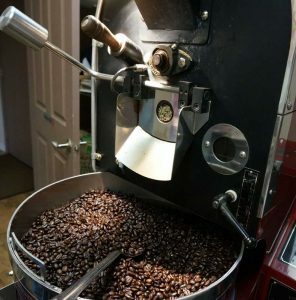 It’s argued when the coffee bean is processed and heated for either a medium or dark roast, the beans are vastly different from their initial state. We probably wouldn’t want to consume other types of beans if they were roasted to these hot temperatures for the same period of time. Personally, I believe some of the nickel in the coffee beans could be roasted away during the coffee roasting process. I don’t have any evidence to support my theory, but I have read that drinking a moderate amount of coffee can reduce your body’s absorption of nickel. Watching the coffee roasting process at Buckin Bean, a local Pendleton, Oregon coffee shop. Dietitian Maggie Moon writes in her book The Elimination Diet Workbook that “Vitamin C, coffee, tea and milk all make it hard for the body to absorb nickel, research shows the amount of nickel absorbed is dampened when nickel was consumed with tea. The exact mechanism is unknown” (pg. 50). Further in her book Moon writes more about nickel and coffee stating “But be aware that tea and coffee tend to have moderate levels of nickel, so it’s good to include them sparingly, perhaps 1 to 2 cups per day” (pg. 173). Using my mostly plastic Black + Decker Auto Drip Coffee Maker, I haven’t had any eczema or skin issues when I drink my daily coffee. I have heard from many others with nickel allergies and nickel food allergies who experienced terrible reactions from the stainless steel reusable filters for some coffee makers. Beware of hidden nickel in your coffee machine or in your metal to-go mugs. Since volcanic soils tend to have more nickel, I drink non-kona coffee, that’s from the rain forest, namely Ethiopia and Guatemala. I’d love to hear if you can or cannot handle 1-2 cups of coffee in your diet, if you’re allergic to nickel in foods. Moon, M. (2014). The Elimination Diet Workbook: A Personal Approach to Determining Your Food Allergies. Berkley, CA. Ulysses Press, p. 50. Yes I drink one to two cups of coffee with milk daily. I can’t tolerate very much tea though, even weak with milk is higher in nickel. I totally understand and love my coffee with milk too. I can tolerate tea, but I have to make sure it doesn’t include any soy in the ingredients. More and more tea companies are putting soy lecithin in tea…which is unnecessary in my opinion. Hi Christy! Hate to admit this but I live in the coffee capitol of the USA, (outside of Seattle WA) and people here tend to be coffee snobs so this would make them snigger….I have been drinking instant coffee ever since I broke the glass portion of my last French Press. I don’t know if it is possible to find a French Press that has no metal in the main press portion of it??? I live alone and only drink one cup a day at most so I just use an organic brand called Mount Hagan. It is the only organic brand of instant coffee that I know of….it comes in a glass jar unlike standard instant coffee. I am a person who avoids plastic like the plague. I will have to check to see where the Mount Hagan coffee is sourced. I am unable to find any exact nickel numbers for the coconut milk, so I limit it to 6 o-8 oz and add a 1-2 TBS coconut creamer (basically richer coconut milk). I am thinking that coconut milk is 99% water so maybe (hopefully) the nickel is not too high?? I can not find data on nickel content of the coconut milk or coconut creamer. For vegan milks I believe my only options now to be coconut or rice milk as far as possibly being low nickel. The others are all nut or flax or soy based so I know those are out. Besides being vegan I am also lactose intolerant and even as a child refused cow’s milk. Digestive enzymes don’t help much. So even if I had to, I can not do cow’s milk….besides I am trying to stay vegan. Do you have any idea on nickel content in coconut milk or the coconut creamer? Thanks, learning a lot from you and Barbara and the FB group. I really appreciate your patience and support! Do you think instant coffee is processed in a way that would make it higher in nickel vs brewing it at home?? PS would love to find some numbers on Maca, really miss it! I believe one of the MANY bad things about nickel allergy is the lack of available info on the items I eat and the contradictions found in all the medical websites regarding what foods are high and low in nickel. Drives me nuts, and ruins eating pleasure as I am getting more and more anxious thinking I am somehow “screwing up” and accidentally going over my daily nickel allotment. I am trying to stay at/under 100 ug but honestly don’t know if I am actually meeting the goal due to no info on some of my items….just guessing and maybe I am guessing wrong? I’m glad you’re finding the FB group so useful. Everyone is really great! Some people with this allergy can tolerate coconut and others can’t. If it works for you, I’d suggest keep drinking/eating it! I don’t know about instant coffee being different. You might check to see if there are any additional ingredients in instant coffee that could contain nickel…like a soy or pea protein. Being diagnosed with a nickel food allergy certainly is an adjustment! 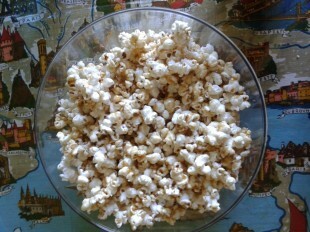 Balancing nutrition and this allergy is challenging. Once my symptoms were tolerable, I now introduce things higher in nickel from time to time. It seems like you’re figuring out what does and doesn’t work for you. It is somewhat of an ongoing experiment! I was recently diagnoised with a nickel allergy and I’ve stumbled upon your blogs/fb page. 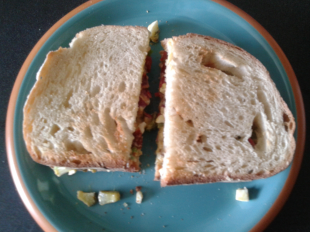 It’s been overwhelmling difficult for me to adjust to eating right. I thought chocolate was hard to give up but COFFEE AND TEA?! I don’t know what to do. I’ve been drinking both coffee and tea every day for years, do you think it’s possible to not be affected by certain products containing nickel? I’m not sure if that’s how nickel allergies work? Of course everyone is different and reacts to things differently…but I think giving up coffee will be very hard for me. Do you recommend drinking something else containing caffeine? Thanks for creating a blog/pages as a safe comforting place for newbies like me to refer back to! Thanks for your positive feedback about my website. I am glad you’ve found the information useful with your new diagnosis. I still drink coffee and green and herbal tea. I make sure the tea doesn’t contain any ingredients high in nickel, for instance no soy or soy lecithin. I think that nickel allergies don’t effect us all in the same way. I have talked to some who cannot eat onions and garlic, but I have no problem with those foods. It might be possible that you’re not affected by tea or coffee like me whereas others are. I think the best thing for the newly diagnosed is to use a food journal for the first month, writing down what you’re ingesting in relationship to your symptoms. That information will enable you to identify your personal reactions to certain foods and drinks, so you can possibly continue enjoying your daily cup of Joe! I enjoy staying in touch and would love to hear how it goes! 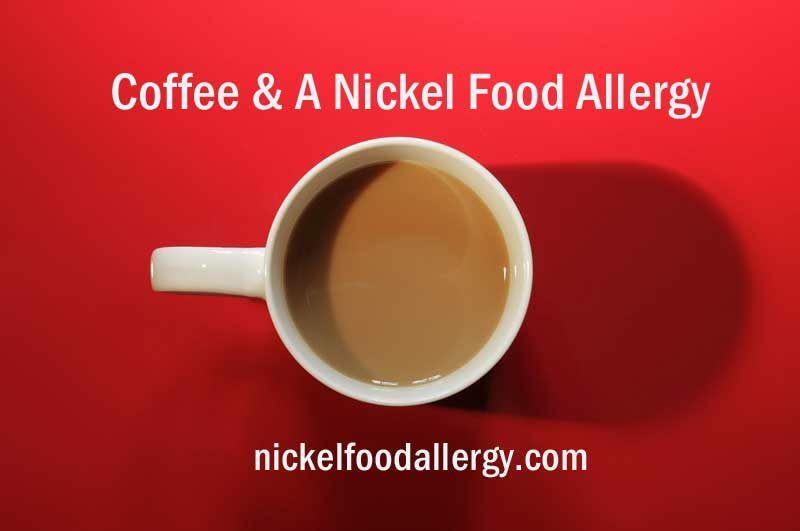 Hi I googled about a link between coffee and nickel allergy and came across this post. I have a nickel allergy and was drinking maybe two cups of coffee a day normally flat whites made in the machine and then I started getting a metallic taste so tryed to have them with just milk or iced coffee so just getting the shot of coffee. Now I am getting a burning sensation around my mouth and what feels like little capileries swelling up that are red. I also got a funny feeling in throat and my ear but only on one side. I also have a Eustachian tube that’s always open and bad reflux have no idea what is causing it all. Am worried and don’t know what it is. Thanks for your comment. What you’re describing sounds terrifying. I’ve heard of some people reacting terribly to the nickel in some coffee machines. Severe nickel allergies can wreck havoc on the human body. Hopefully a medical professional can determine an appropriate course of action to resolve the issue. My name is Rafaela, and I live in Brazil. 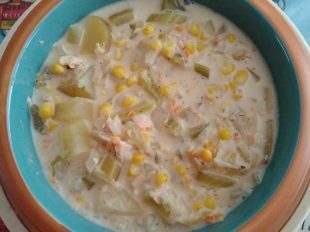 I was diagnosed with nickel allergy soon and found her Blog. I loved the information and tips. I found your Blog when researching about coffee and allergy. But I still have a question, do you know if coffee made by the nespresso machine contains more nickel than the traditional coffee? Thanks for your comment and appreciation for my website. I’m glad it’s helpful. Unfortunately I don’t know about the nespresso coffee machine. You might consider contacting the company directly and asking about the specific model and whether or not the internal components that come in contact with the coffee or water are made with stainless steel or nickel. Their company customer service reps. would know more about their product than me. I hope that’s helpful. Thanks for your comment. I LOVE coffee and it’s wonderful to have daily indulgences. Eczema on your hands can be very painful. Even though I don’t touch a lot of cash regularly, washing my hands during the winter cause my hands to become dry if I don’t use lotion often. Have you considered using nitrile-free gloves? Many gloves contain nitrile which unfortunately contains nickel. I don’t drink often, but prefer lemon drop martinis and margaritas. Sometimes my skin will react the next day and it’s hard to know if it’s because of the alcohol itself or the ingredients in the alcohol. I always react when I drink wine and beer. My resources page has some information about hidden allergens in common alcohols. I’m getting tested next week. I’ve had jewelry issues for 36 years but never knew it could be a systemic problem. I got a pacemaker in 2010 and my fatigue just keeps getting worse with no explanation. Also have severe sleep apnea. I often think I’m tired after my coffee, so I found you by searching for that. I’m excited to find a reason for my fatigue but really anxious about changing my diet. Already stopped using my beloved stainless steel mugs and water kettle for pour-over coffee. Thanks for your comment. I know of so with systemic nickel allergies that experience severe fatigue. If it is a nickel allergy, perhaps changing out some of your regular cookware could help as well. I understand how overwhelming changing what you eat can be. I hope you find solutions soon!